Smitaki: February 2 – Who the hell is Chimonas? On many winter days, this cold, wet season in Greece (chimonas) is difficult to recognize: temperatures try regularly to reach summer values and when the first rains inundate the earth, lots of plants hurry to start growing and some to flower even before winter officially begins. Long long ago there was no winter in Greece. When this world was run by the Olympic gods, there was a bunch of goddaughters, the Horae, who were responsible for the seasons, the hours of the day and the gate to Olympus. According to Pausanias, three of these Horae took care of the seasons: Thallo, Karpo and Auxo. According to others there was also another trio: Eunomia, Dike and Irene. Not to complicate matters I will tell about the three from Pausanias. As I imagine it, these young ladies played in juicy green meadows when Thallo had the plants grow (anixi = spring), jumped into the waves when Karpo warmed up the sea (kalo kairi = summer) and ate their bellies full when Auxo came up with abundant harvests (ftinoporo = autumn). Chione, daughter of the cold north wind Boreas, befriended them and sometimes sprinkled some snow. 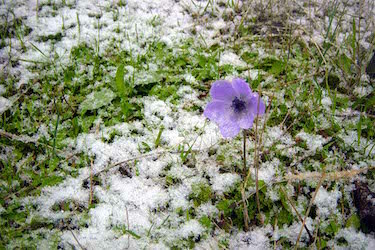 Then Boreas – under the name of Kheimon – claimed a season for his snow queen: and since then Greece has had four seasons. That Kheimon's claim was wrong, is proven by many a Greek winter in which autumn and spring embraces each other seamlessly. That’s maybe why the Greeks say that winter only starts in February and makes way for spring in March, leaving not too much time for Kheimon to bully the island with icy roads and wind. It is fascinating to discover how many mini climates exists on Lesvos. In the mountains it’s always colder, Kalloni and its central plains record in summer the highest and in winter the lowest temperatures. Especially in spring, autumn and winter Plomari enjoys a certain southern warmth; the mountain village of Agiasos at least once a year gets covered by a blanket of snow, in the west Sigri has a moderate climate and is seldom without wind, in the north Eftalou (not far from Molyvos) is summer and winter cool and Mytilini goes with the flow. They say most rain is dumped around the Gulf of Yera. However, some years’ ago after heavy rainfall, disastrous mud streams flowed through the streets of Agiasos and villages like Akrasi, Ambeliko and Stavros also had roads completely destroyed. Kalloni regularly gets flooded through not cleaning its rivers and this year it was Eresos and Andissa (and surroundings) that had to report lots of damage due to too much water. These past months it has been particularly wet, making many rivers – in the summer only recognizable by their dry beds – stream merrily and block paths and roads (most of them you can wade through). Boreas only last week came to visit with icy wind, leaving his daughter home. When he was fed up with blowing, the almond trees, so happy with all that water, carefully started to unfold their pink blossom. Shame upon the ones who may now irritate Boreas: then we can forget about the almonds, just like last year, when Chione – who knows - celebrated a special birthday with lots of snow, killing the almond blossoms. At some moment the Horae and Kheimon were brought down by Demeter, who had a better plan for the seasons. She lost her daughter Persephone to Hades, king of the underworld and Persephone had permission to visit her only once a year. That was the summer. When Demeter started looking forwards to her daughter’s visit, she made everything grow (spring) and from the moment Persephone left, she wept oceans of tears and all the plants died (autumn). In the winter she sat uselessly next to the stove, even though outside there was lots to do: harvesting olives, mushrooms, citrus fruit and loads of wild vegetables. So her story about seasons is not quite right: not everything died. Moreover, January traditionally also has some summer days: during the Alcyonides days (one to two weeks) you can easily do without winter clothes, while the kingfishers make love and build their nests. I bet Demeter then skypes with Persephone, a little revival for her sad heart. But she does not act consistently: last January we waited in vain for this lovely weather phenomenon. If I were to run the world, I’d have Demeter laid-off in order to bring back the three Horae and I have Boreas with his Kheimon pseudonym banned to Hades. Three seasons give much less confusion to the island and it will be the best publicity for winter tourism: where the winter has been thrown out. Listening to the birds and looking at all the flowers now, they all agree: it is early spring, not winter.